Comparing files in directories can sometimes be a powerful tool to determine if data has been changed without the owner's consent. A webmaster could for instance compare a backup with the data on a hacked web server, to determine which files have been modified by the attacker. But it is not only webmasters who may make use of a software like TreeCompare. Developers, writers, artists or system administrators may also find it useful to compare data under specific circumstances. And TreeCompare has just been designed for that purpose. The free portable program for Windows compares the files of two selected root directories, including files in subfolders. The two directories have to be selected in the beginning. This is done with the file browser, a click on compare will compare the contents of the directories. Each unique file is displayed in its own row in the program. The columns path one and path two specify if the file exists in directory one or two. 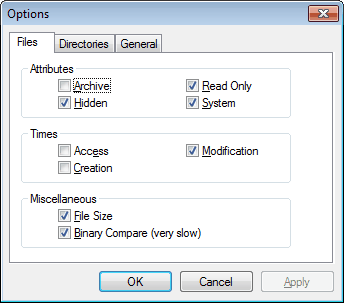 The description column lists if the files are identical, or different. TreeCompare compares several parameters that are divided into the categories attributes, times and miscellaneous. Parameters can be edited in the options, so that only relevant comparisons are made. The software lacks the option to display the differences in detail, and there is also no option to open the file in an editor, or the directory in Windows Explorer to investigate the differences further. Still, TreeCompare is a lightweight (33K) tool for Windows that may come in handy for quick directory comparisons. Users who need additional information should take a look at Winmerge instead. Your blog is great ! Thks for such a good job. What about freefilsync which can be launch on win or linux?